France is taking PFS very seriously. Two weeks later, ANSM's director of dermatology, Dr. Caroline Semaille, launched a PFS public-awareness campaign, chiefly by relaying the potential dangers of finasteride to a number of national media outlets. Dr. Semaille was equally vocal in the print media. "ANSM has also looked closely at reports of adverse reactions to finasteride in France. There have been 40 such reports in nearly 20 years. And those numbers are not taken lightly." 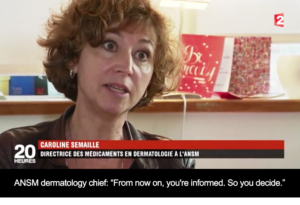 "We know [these adverse drug reactions] are undervalued, because France does not have much pharmacovigilance reflex. And, worldwide, 508 serious psychiatric cases, including 25 suicides, have been identified… From now on, you're informed. So you decide." "No one forces patients to take finasteride. What’s important is that they be able to decide, that they be cognizant of what they may be risking if they take the drug." 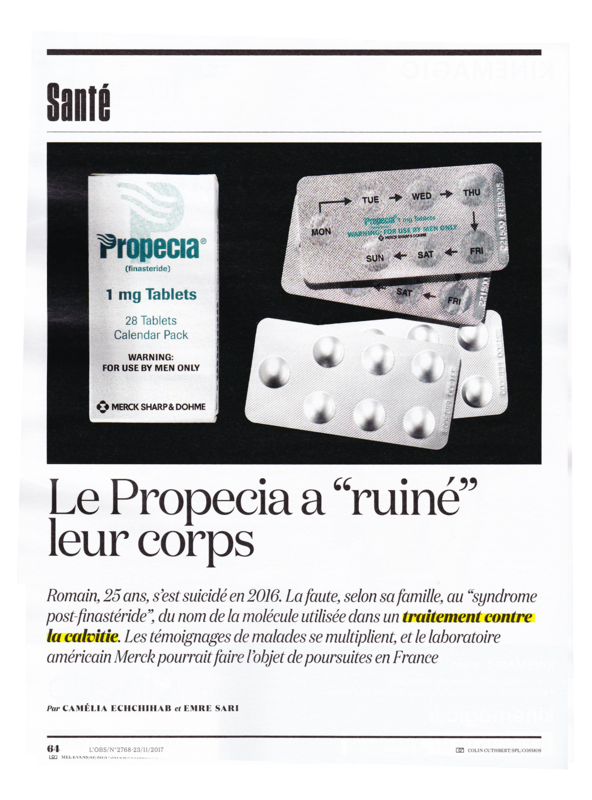 The four-page, 4,000-word L’Obs feature, which focuses on the 2016 suicide of 25-year-old PFS patient Romain Mathieu—and noted that "Nearly 128,000 Frenchmen were exposed to [finasteride] in 2016"—also cited PFS Foundation CEO Dr. John Santmann. "When you take finasteride, you are eliminating the effects of testosterone. You don’t need to be a ranking scientist to figure out that finasteride is probably not a good idea,” Dr. Santmann said. To watch English-subtitled versions of the 20 Heures and France 3 News stories, please access the PFS Foundation YouTube channel here. Meanwhile, we’d like to remind all PFS patients, and/or their loved ones, who have not yet done so to report their symptoms to the FDA’s MedWatch program as directed here. Those living outside the US should also access the WHO’s Collaborating Centre for International Drug Monitoring list of pharmacovigilance agencies and report to their respective nation's health agency.